This article got served up to me by one of the Web sites I follow with my RSS reader at work; it’s a pretty interesting piece by an author named Steven Johnson called “How to Write a Book.” I find myself increasingly more interested in learning more about this type of writing, and reading about Steven’s process was fascinating. DIY: How to write a book – Boing Boing. Here at Casa del Bartlett, the audio/visual apocalypse is upon us. A few weeks back, my trusty 27″ JVC television that I bought in 1995, right after I graduated from college, finally went to that big electronic graveyard in the sky. For the second time in its life, the tuner went out; having already replaced said tuner once, and had no less than three repairs done to fix the power button (which has always been a flimsy and shatter-prone piece of garbage), I decided to retire the TV to the basement, where it can live out its days playing DVDs in front of the treadmill. So, we’re in the market for a new TV, and had planned on spending some hard-earned tax-return goodness to finance the purchase. Cue tonight. Six years ago, I bought one of these: a Sony DAV-FC7 5-DVD Dream System which, by all available indications, is a total piece of trash. It worked great for a long time (and, in all honesty, I’ve used the hell out of this thing), but about a year ago the speakers started to hum when it was set to the Video 2 inputs (regardless of whether anything was connected to the Video 2 inputs, audio or video) and a lesser hum from Video 1, even though the DVD player still worked. Well, shortly thereafter, when playing back DVDs, the system would either freeze completely after about 90 minutes, a problem which could only be resolved by turning the system off and back on, or drop the sound from the DVD, which could be remedied by switching chapters (although a sound drop typically meant a video freeze was coming shortly). Well, tonight, it just refused to play discs of any sort altogether. DVDs were met with a “Can’t Play” message on the main console, as were audio CDs and a lense cleaner disc I tried. So – we now need a new TV, and our home theater system has now blown out as well. I spent the better part of a half hour getting our Playstation 2 rewired to bypass the theater system entirely and run directly into the TV, so at least now Helen can watch her movies – sparing us from yet a third chapter in the AV Apocalypse which surely would’ve been the most bloody of all. But we’re left with a janky little 26-inch TV in the living room, have a now basically useless home theater system and we’re hoping the seven-year-old Playstation 2 holds out long enough to serve as our emergency DVD player until we work all this out. Mel’s mom couldn’t figure out how to push a button to get the DVD player going before when she was over to watch Helen; she’s screwed now that she’ll have to use a PS2 controller to navigate a DVD menu. And, just to add icing to the delicious cake, it takes two hours to get to the nearest Best Buy. Just in case anybody was afraid Obamania hadn’t gone far enough yet, in step the Japanese to ensure that the limits of silliness have yet to be reached. 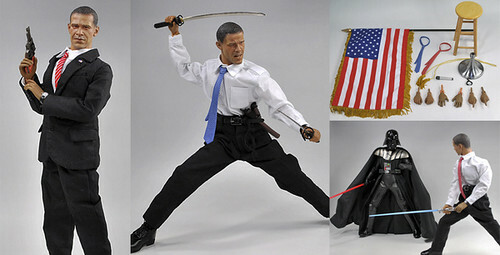 Obama – swordsman and gunfighter. Seriously, this comes with a lightsaber. Is it sad that I’d probably want one of these if I saw it? Of course not. 8:12 – hah – time travel. Good times. President Obama issued several executive orders earlier today laying out new ethics guidelines for the members of his administration (you can read CNN.com’s pathetic coverage of the announcement – all two sentences of it; MSNBC has slightly better story). I heard the President announcing the orders on Minnesota Public Radio as I was driving home for lunch at around 12:30 p.m.; three and a half hours later, the text of the executive orders has yet to be posted to the appropriate section of whitehouse.gov. I’m curious to see what the lag time will be between announcement and posts to the White House site. As immediate as the transition was from whitehouse.gov v.Bush to v.Obama on Tuesday, and as on top of the Web as Obama’s team has been since the start of the campaign, I expected the delay to be shorter. I’ll be watching tonight to see what time those documents hit the White House site. EDIT 7:14 p.m. Central – they’re posted.